We know that thermostats regulates temperature at home. There are plenty of technologies which turns a thermostat into a smart thermostat. However, for this article, we’ll focus on the smart thermostats which supports Z-Wave communication technology. Then, we also have a list of the the Best Z-Wave Thermostats out there. We’ll cover important things to about Z-Wave thermostats. And also, we’ll provide you helpful things to consider for choosing a good Z-Wave thermostat as guide for buyers. Why Invest In A Z-Wave Thermostat? Will A Z-Wave Thermostat Work On Most Z-Wave Hubs? When we say Z-Wave thermostat, we refer to smart thermostat which supports or uses Z-Wave technology. These smart thermostats are powered by Z-Wave to give you remote control and management of the temperature of your home. These smart thermostats can connect to Z-Wave smart hubs. And, smart hubs have Web and mobile applications which provides control over your smart home settings which includes your thermostat.Through the smart hubs, you can now control the temperature of your home wherever you are. Whether you are at home or away from home, you have total remote control of your thermostat. There are smart thermostats which supports other communication protocol like Bluetooth, Wifi, Zigbee and more. All of these technologies provides smart capabilities of a smart thermostat. But for this purpose, we’ll talk about thermostats which uses the Z-Wave communication protocol. Here’s the quick overview of our list of the best thermostats which uses Z-Wave technology. 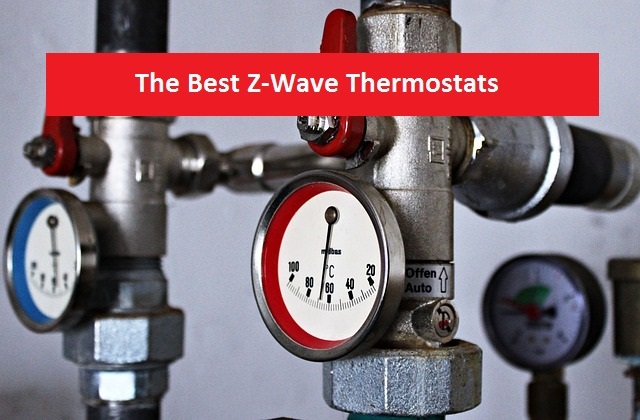 This list features our take on the Top 5 Best Z-Wave Thermostats in the market. But if you want to learn, we’d suggest to read on the details about every thermostat in this list. The first in the list is the GoControl Z-Wave Thermostat. The GoControl brand offers a wide variety of smart home devices. The GoControl smart devices are engineered by Nortek Security & Control which is one of the leading manufacturers of Z-Wave products worldwide. Nortek Security & Control is a member of the Z-Wave Alliance so their devices are definitely Z-Wave certified. The GoControl Z-Wave Thermostat is currently one of the best rated Z-Wave thermostats in the market. This smart device offers you management of the comfort of your home from anywhere you are. It is one of the easiest thermostat to install. This smart thermostat is compatible with most of Z-Wave hubs. Using the app which comes in with your smart hub, you can integrate the control for this device. This way you can control and manage the HVAC settings of your home wherever you are. This will help not only for the comfort of your family but it will help save energy usage. This smart Z-Wave thermostat is powered by four AA batteries. The front loading compartment will hold the batteries which should last for 2 years. However, this thermostat can also be powered through connecting to the 24VAC ‘C’ wire of the HVAC system. Next in line is from 2Gig, the CT100 Z-Wave Programmable Thermostat allows you take control of the temperature of your home. The control over the temperature can be done remotely. Aside from that, you can also set a seven-day programming on this smart thermostat. This also provide seamless integration with the Go!Control panel. 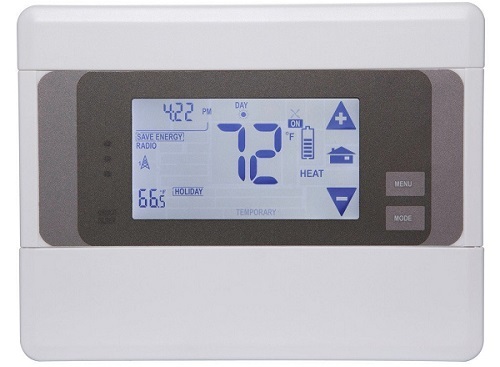 This Z-Wave enabled thermostat gives you great options and functionality to fulfill a temperature-efficient home. 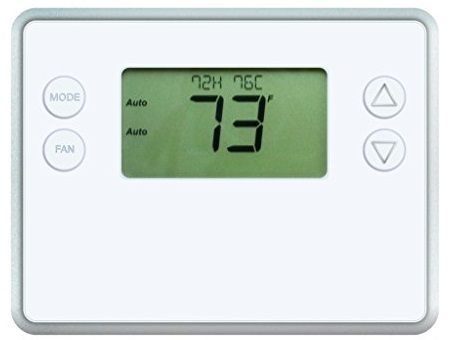 The CT100 Z-Wave Thermostat features an ultra slim form factor. It also has a bright display with touch screen. Please note that this smart thermostat requires a smart hub. The battery of this thermostat has a 2-year lifespan. And, this thermostat supports 4 stage heat. 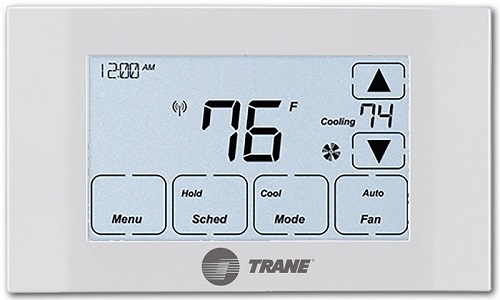 The Trane Nexia Home Intelligence Z-Wave Thermostat is also a good Z-Wave thermostat from Trane which gives you remote control and adjustment of temperature of your home. It also allows you to monitor and reduce energy consumption of your home. You can perform all of this through an application in your smartphone or personal computer. It provides your thermostat of one cooling and two heating stages. If you have Nexia Bridge smart hub, you can connect this smart thermostat. If you love voice control, this thermostat also works with Amazon Alexa. Just remember that this Z-Wave thermostat requires a smart hub. It features a digital black and white touchscreen control. This thermostat also allows you to have 7 day programmable with up to 4 schedules per day. For maintenance, this thermostat can send you reminders to help you extend the life of your HVAC system. Lastly, this is compatible with conventional 24V control heating or coooling systems. Installation of this smart thermostat is easy. Most people can install this thermostat within 30 minutes. The minimum number of wires required for most single stage systems is 5 wires with 1 of which must common. It is compatible with most smart home automation systems. The Radio Thermostat CT32 Programmable Thermostat allows you to control of up to 2 stages of heating and 2 stages of cooling. This smart thermostat from Radio Thermostat is enabled by Z-Wave to give you automation control of your home’s heating and cooling system. With this, you can have management and supervision of the energy usage of your HVAC system even when you’re away from home. Aside from that, this thermostat gives you a programmable feature with up to 4 independent periods a day. It works with nearly any HVAC system which includes the traditional furnaces and heat pump. 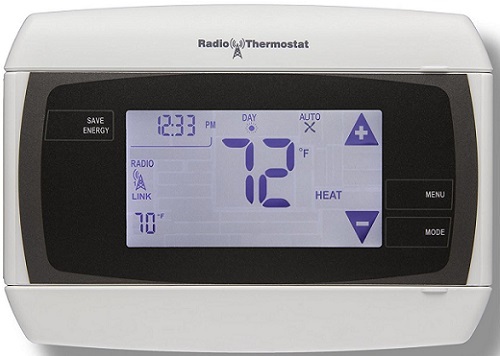 This is a 7-day programmable thermostat with touchscreen controls. This thermostat is powered by batteries which is good for those who don’t want the hassle of having the C wire connection. Take a look at how this smart thermostat is installed. 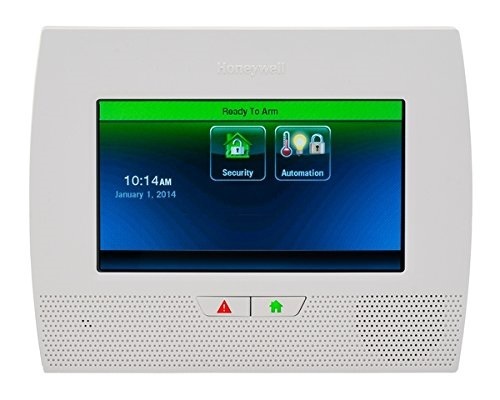 The Lynx Touch 7000 Control System is smart device from Honeywell. This is not a thermostat only but a complete control system. Unlike the thermostats in this list, this smart devices comes in with several high-end features which does say about its price. This features a bright and 7″ full-color touchscreen display. It also features graphical icons and intuitive prompts for easier operation. Aside from that, it also features an on-screen video, advance alarm communications, garage door notification and control, tornado alerts for those living in US and Canada and software upgrade remotely. But the most important feature why it is included in this list is of course its Z-Wave capability. This smart device also has Wifi module which provides alarm communications and remote services solution. It has its own mobile application which is called Honeywell LYNX Connect app. This application allows your mobile device to view video and operate the system on premises. With Z-Wave, you can integrate also other smart devices intended for security, lighting, thermostat, water valves and among others. This smart devices has a lot of smart feature that you can use for your home. Check it here. Smart thermostats are powered by different communication technologies to make them smart. Z-Wave is just one of several technologies like Wifi, Bluetooth and Zigbee which allows us to have wireless control over thermostats. However, one of the most supported technology used in smart home devices like in thermostats is the Z-Wave communication protocol. This is because this technology is created with the home automation in mind. This makes it a good fit for creating a smart home. Why would you invest in buying a thermostat that supports Z-Wave? It’s because Z-Wave is used in plenty of other smart devices most especially in smart hubs or controllers. Remember that most of the Z-Wave thermostats requires a smart hub to connect for you to control is remotely. Most of the smart hubs have their own PC and mobile applications. So when you integrate your smart thermostat to a smart hub, you can now control your thermostat through that smartphone application. The best thing about having a Z-Wave thermostat is that there are plenty of smart hubs which uses or supports Z-Wave. If you already have one, then it most probably have support for Z-Wave. Not only that, there are plenty of other smart devices also like light switch, light bulbs and door knobs which uses Z-Wave technology. So, you can build your home automation system completely based on Z-Wave. If you are afraid that your Z-Wave thermostat will not work with a Z-Wave smart hub with a different brand, you are most likely wrong. The good thing about Z-Wave technology is its interoperability feature. This means that all certified Z-Wave smart devices can communicate with other brands’ Z-Wave devices. Thus, Z-Wave certified smart devices are compatible with each other no matter what the brand is. This is our guide to help you pick the best Z-Wave thermostat for your home. We know what it means to get the worth of the money you get our of your pocket. So, we hope that these tips can help you find the right Z-Wave thermostat for your smart home. Do you have your smart home automation in place already? If you already have a Z-Wave smart hub, please still research if your smart hub doesn’t have an issue with the Z-Wave thermostat you’re considering to buy. Sometimes, even if Z-Wave devices should work with each other, there are still issue people encounter. A good way to start is to read the product descriptions of both the thermostat and the smart hub. A good venue also is to read the reviews of the smart thermostat itself to see if others have used the same smart hub with yours and doesn’t have any problem. You can also ask a question in thermostats sale page so their support can answer you. Always consider your existing HVAC system if it is supported with the Z-Wave thermostat you are planning to buy. A good way of knowing this is to ask directly the support of the thermostat manufacturer. This is the fastest and easiest way to get your answer. After all, your smart thermostat should work with your existing HVAC system. Are you replacing an old thermostat which is not a smart thermostat? You should consider if you need to have a C Wire connection or you’re okay with the smart thermostats which are battery-operated. Read on the descriptions of the Z-Wave thermostat you’re considering if its battery operated or needs C Wire connection. Sometimes, one supports both. Always read reviews of the Z-Wave thermostat you are looking to buy. A good avenue is the reviews of customers from Amazon. At the b0ttom of the product’s Amazon page, there are reviews of customers. These reviews should give you insight and valuable information about the Z-Wave thermostat you are looking. A good smart thermostat will give you great control over the heating and cooling system of your home. It gives you this management of your HVAC system wherever you are. You can achieve this when you have the best Z-Wave thermostat which fits your current home automation system. With integration to your smart hub, you can monitor and regulate the temperature of your home just from a mobile application. These advantages are worth the investment of a smart thermostat. It will give you convenience, and at the same time, control over the energy consumption of your home HVAC system. So, this will help you with your thermostat needs and with some cool improvement over your HVAC system. This list of the best Z-Wave thermostats is just a guide for you, so we wish you the best for your home. Hope this helps you find the best smart thermostat for your home.